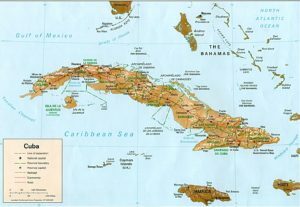 Cuba is Located 90 miles south of Key West, Florida, It is the largest Caribbean island nation often referred to as the Pearl of the Caribbean. Neighboring countries include Dominican Republic, The Cayman Islands, Jamaica and Haiti. Over 780 miles long and Spanning 44,200 square miles makes it just a bit smaller than Pennsylvania. Its geography is varied and includes rugged mountains, farmland, urban metropolises, quaint Colonial villages and some of the most beautiful white-sandy beaches in the Caribbean. Cuba is divided into 15 provinces and one special municipality called Isla de la Juventud.